Let it be said that I do not like heights. I also do not like cleaning out gutters. Add those two “dislikes” together and you get the iRobot Looj. The Looj, unlike iRobot’s Roomba, is slightly less intelligent than a broom on the end of a large stick, but it serves a very important purpose: to reduce the amount of time you spend on a ladder when cleaning gutters. The Looj is basically a motorized tank with a remote control and a front sweeper. You ride it down your gutters, flipping out twigs and leaves as you go. Does it work? Absolutely. Is it foolproof? Probably not, but it’s a lot of fun. It also has a safety line attachment in case it gets stuck on dead bird guts. Generally, it’s not too bad for $169. As you see, I have an older house with tighter gutters. While the Looj was able to ride down the gutter, it got caught up on the sides as it travelled. I was, however, able to force it to move out of tight spots as necessary and it never hung up irretrievably. The flippy-flappy head on the device was able to push out dust and branches and, although our gutters were surprisingly clear, I could imagine they’d do a job on leaves and other crud. The Looj has a remote control that runs the machine forwards, backwards, and activates the brush. The handle connects directly to the device and snaps off quickly and easily. Sadly, the Looj suffered a three story drop during my testing but the fall only broke a back wheel and smashed the rope attachment. The Looj still worked, even after that rough treatment. I would definitely recommend this to owners of newer homes who may have heavy schmutz in their gutters. 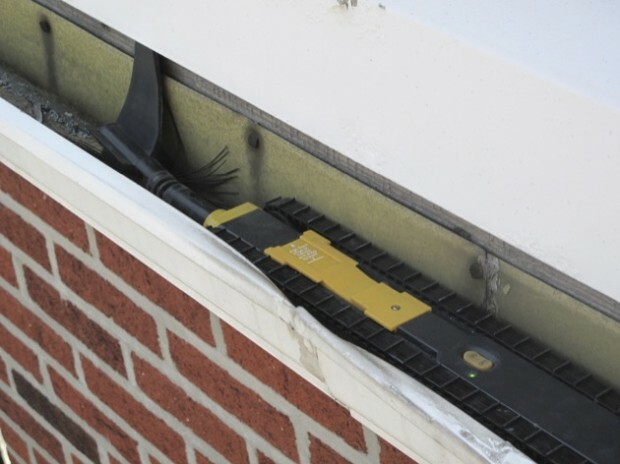 If you place your ladder at a corner of the house – and your gutters are wide enough – you can easily clean out two sides of a house in a few minutes. Cleaning out gutters is a tedious job. The Looj, in its own madcap way, makes that job considerably easier.